Tags, also known as ‘Preauricular skin tags’, are small extra nubbins of skin and sometimes cartilage situated in front of the ear. They may be associated with a completely normal ear or part of a more complex condition such as Microtia or Craniofacial Microsomia. This should be checked when the child is examined. Tags can be removed when the child is old enough for an anaesthetic as a simple day procedure. A small scar results. 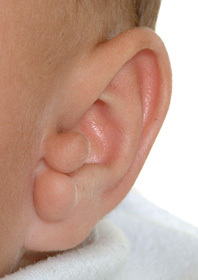 If there is an associated ear anomaly it is sensible to remove the tags as a baby and leave the other surgery until the child is an appropriate age.